Debra Wink, God bless her, is helping me recover from the loss of my seed starter. In the meantime, because we're out of sourdough loaves--the freezer, at this moment, only holds two baguettes, and some hamburger size soft baps--I've baked my favorite sourdough 10/45/45 Rye/Bread Flour/AP Flour, 68% Hydration converted to a 12 hour sponge, with commercial yeast prefermenting 20% of the formula's flour. 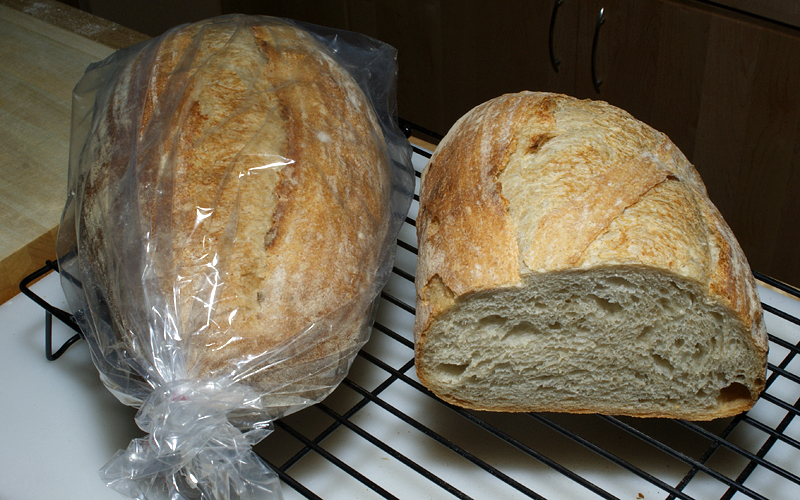 I'm not giving up on sourdough, but I have to say, "This bread is tasty!" One's ready for the freezer. At least three kinds!!! Hurry, hurry , hurry but, DO NOT hold up a sourdough repository. Some of those people like the sourdolady can be VERY dangerous. Ask some of your friends ABOUT SOME OF THE violent results of attenpted Sourdough robbery. With step-by-step guidance from TFL's own Ms. Debra Wink, a new starter is quietly bubbling on the counter, and like all newborns expecting to be fed frequently. Another week or so, and I'll post its inagural loaves. I to had to start fresh and this time around I used Debra Winks Pineapple method ..it was easy to follow and after about 2 weeks it was ready to use. That was back in the winter and it's back to it's lovely flavour this summer. Having learnt by my mistake I've dried some this time for insurance. I think I read in your other posts with Debra that your dried wasn't successful? Or is that what you're rebuilding now? a built-in problem with dried starters is they are competing, on a level playing field, with everything else intr0duced on the flour used for feeding. In my case, initially, the bacteria in the feeding flour (or undesired bacteria in the dried starter or its added flour) won out. It acted just like a starter built simply with flour, water, temperature and time: on day one it produced lots of gas and bubbles, destroyed the gluten net, and stank. Dutifully, I continued to refresh it with the same flour, and it continued to produce gas, destroy the gluten net faster, and stank even more so. On the third or fourth day it still destroyed the gluten net, and continued to stink, but suddenly ceased producing gas. It just puddled and stank. I figured it was a goner. I've never had a bad starter before now. I've purchased, and initiated two others in years past with no problems, and I've never tried to make a starter from scratch, so I was in uncharted waters. I've read Debra's tutorials before, and reread them this past week, but I was frankly in over my head, and not certain what I understood applied to my problem. At that point, hope waning, I asked Ms. Wink for help. Its been a great learning for me! ...for linking to the 'blow-by-blow' account. That was very interesting and informative reading and, as you put it, a great learning experience! Your non-SD loaves look great, though! I had a similar problem reviving my home-dried starter...I read everything I could find on the topic, before I started, but no dice! It would bubble a little bit (bacterial action) but I could tell from the color and the lack of any real expansion that the rye flour I'd added in small amounts was not being consumed by any familiar yeasts. My several year old starter was spotted on top with mold, after having been neglected in the fridge for a few weeks and I had the dried stuff in a Ziploc bag, lightly refrigerated, but not frozen. I followed the instructions posted somewhere here, but was getting nowhere fast. I tried for quite a few days, but no change...I decided if it was going to take more than a week to recover, I might as well begin a new starter from scratch. That's when I decided to try to revive the 'moldy old dough'. It was very successful, and it's actually a little more aggressive and a bit 'tangier' than it was before the resuscitation. Thanks again; my thanks, also, to the incomparable Ms Debra Wink! If we had a Living National Treasure program, like some countries have I'd nominate Ms. D. Wink. I've read and benefited from her posting before now, but her kind, personal guidance was awesome. Only a few scientists know how to choose language that doesn't overwhelm a lay person with technical vocabulary, yet make the science accessible. She does it wonderfully. I have Ms Wink to thank for most of my sourdough 'adventures'. The best, most understandable advice out there. 'National Treasure' for sure!